Quink gets Murphy Award | Mapping urban blight | What about contrails? Patrick Dougherty (’14) graduated from the University of South Florida with a Master’s of Urban and Regional Planning in May 2016 and accepted a full time position at a local planning/engineering/design firm in Tampa, Florida as a planner and GIS analyst after a year and a half internship with the same company. Yanni Cao selected as 2016 Esri User Conference Student Assistant. She attended and served the conference last month in San Diego. Send your good news and travel photos to geography@psu.edu. We want to hear about your new jobs, new babies, new awards, new travels, new publications, etc. The Department of Geography Speakers Committee is accepting names for Miller Lecture and Coffee Hour speakers for the upcoming academic year. Send your suggestions to Guido Cervone by July 31. Tyson J. Quink, a Penn State student, was selected to receive the 2016 Lt. Michael P. Murphy Award in Geospatial Intelligence. He was honored on June 28 during the 2016 Esri User Conference held in San Diego, California. Quink was presented with the award from Jack Dangermond, president and founder of Esri; Keith Masback, CEO of the United States Geospatial Intelligence Foundation; Heath Rasco, director, of technical programs for DigitalGlobe; and Steve Handwerk, geospatial intelligence faculty member with the College of Earth and Mineral Sciences’ John A. Dutton e-Education Institute. Urban blight in the western Pennsylvania city of New Castle is the focus of Chase Palmer’s internship. The rising Penn State junior, double-majoring in Community, Environment, and Development and in Geography, will spend the summer looking back at the Lawrence County community’s past, and looking ahead to its future. Do contrails effect conditions on the surface? You don’t have to be a meteorologist to know that clouds have a significant impact on the Earth’s climate. They cool the planet’s surface by reflecting the sun’s rays, warm the atmosphere and surface by absorbing solar and longwave radiation, and even replenish surface waters through precipitation. But what about artificial clouds, particularly jet contrails; do they affect the Earth’s climate too? For several years, Penn State geography professor Andrew Carleton and his university colleagues have been trying to find out, and they’re using data from NOAA satellites in the process. Alexander Klippel has been named the first Stuckeman Center for Design Computing (SCDC) Faculty Fellow for the 2016–17 academic year. The Fellowship has been made possible by José Duarte, Director of the SCDC and Stuckeman Chair in Design Innovation. The fellowship will allow Klippel to deepen a collaboration that has been successfully developing over the last year and has resulted in funding through LMI, Penn State’s Ecology Institute, COIL RIG, and Penn State Cyber Science Institute. 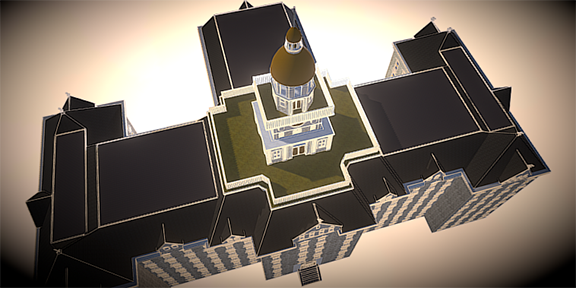 The goal of the fellowship is to foster joint research interests in 3D modeling and virtual reality, to enable student and faculty interaction, and to offer a new course on virtual reality in spring 2017. Additionally, through a recently funded COIL RIG proposal VR contributions will be made to a design studio taught by Duarte in the spring of 2017, focusing on studying and understanding the design of a favela located in Santa Marta in Rio, Brazil. This new book researched and written by the notably accomplished geographer Daniel W. Gade (1936–2015) is a collection of papers on a wide range of topics set in the Urubamba Valley and the surrounding tropical uplands of the Andes Mountains of southern Peru. Climate change and wildfire | Alum wins SAG at esri | Do we have your address? 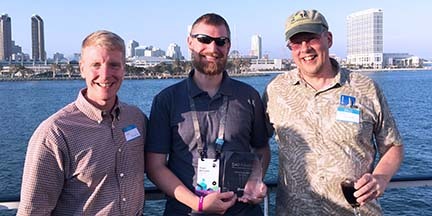 One of our MGIS alumni was part of a group that won a Special Achievement in GIS award at the Esri User Conference— a big deal in the professional scene. The photo here shows the alumnus Roger Bannister (center) with Doug Miller (right) and Pat Kennelly (left), two of the professors he worked with. • Cindy Brewer gave a presentation at The Village at Penn State as part of the Conversation with Colleagues Colloquium on June 23. • Send your good news and travel photos to geography@psu.edu. We want to hear about your new jobs, new babies, new awards, new travels, new publications, etc. • Do we have an up-to-date postal mail address for you? We will be mailing out the department newsletter in a few weeks. If you’re not sure, email your name and current postal address to geography@psu.edu. • The Department of Geography Speakers Committee is accepting names for Miller Lecture and Coffee Hour speakers for the upcoming academic year. Send your suggestions to Guido Cervone by July 31. Ed Parsons, Google’s geographer-in-chief, is leaning over an 18th century woodcut map from the Chonhado, the Korean atlas of the world. Here, on thin parchment, the earth is a wobbly blue watercolor dot centered around the sacred Mount Meru, close to a large red circle representing Beijing. China and Korea make up the large part of the map, while the foreign lands beyond their borders are like afterthoughts, represented only by a thin peripheral strip of land. By Zhang, Yu and Yang, Tse-Chuan, and Matthews, Stephen A. The goal of this study is to develop a method that is capable of inferring geo-locations for non-representative data. In order to protect privacy of surveyed individuals, most data collectors release coarse geo-information (e.g., tract), rather than detailed geo-information (e.g., street, apt number) when sharing surveyed data. Without the exact locations, many point-based analyses cannot be performed. While several scholars have developed new methods to address this issue, little attention has been paid to how to correct this issue when data are not representative. To fill this knowledge gap, we propose a bias correction method that adjusts for the bias using a bias factor approach. Applying our method to an empirical data set with a known bias associated with gender, we found that our method could generate reliable results despite the non-representativeness of the sample. This manuscript engages with the U.S. civil rights movement and offers reflections on how critical scholarship and pedagogy can benefit from a robust engagement with the African American freedom struggle. While widely studied in other disciplines and despite the work of some very committed geographers, the U.S. civil rights movement has enjoyed less critical scrutiny within the broader discipline. More specifically, I outline a set of broader concepts that can be utilized and which illustrate the power of grass-roots social movements to change oppressive social conditions. This has implications not only for social and cultural geography, but also for the ways we engage in the hard and often unrewarded work of classroom engagement and teaching. OpenStreetMap (OSM) thrives on allowing anyone in the world to contribute features to a free online geographical database, thereby allowing international mixes of contributors to create the map in any given place. Using South America as a test area, I explore the geography of OSM contributors by applying automated language identification to the free-form comments that contributors make when saving their work. By cross-referencing these languages with users’ self-reported hometowns from their profiles, I evaluate the effectiveness of language detection as a method for inferring the percentage of local contributors versus the percentage of “armchair mappers” from elsewhere. I show that most English-speaking contributors to the South American OSM are from outside the continent (rather than multilingual locals). The percentage of English use is higher in poor areas and rural areas, suggesting that residents of these places exercise less control over their map contents. Finally, I demonstrate that some features related to daily needs of health, education, and transportation are mapped with higher priority by contributors who speak the local language. These findings give researchers and organizations a deeper understanding of the OSM contributor base and potential shortcomings that might affect the data’s fitness for use in any given place. In Bull. Amer. Meteor. Soc. Scientists from 13 countries involved with modeling and observing the coupled high-latitude weather and climate system discussed our current understanding and challenges in polar prediction, extreme events, and coupled processes on scales ranging from cloud and turbulent processes, from micrometers to a few hundred meters, to processes on synoptic-scale weather phenomena and pan-Arctic energy budgets of hundreds to thousands of kilometers. Workshop participants also evaluated research needs to improve numerical models with usages spanning from uncoupled to fully coupled models used for weather and climate prediction.